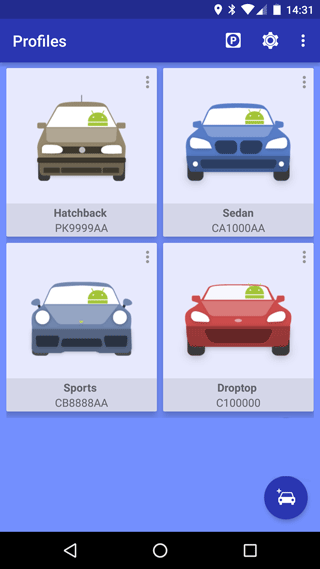 Create a profile for each one of your cars and send parking messages with a single tap. Additionally, you can schedule sending SMS at a specified time up to 24 hours ahead. 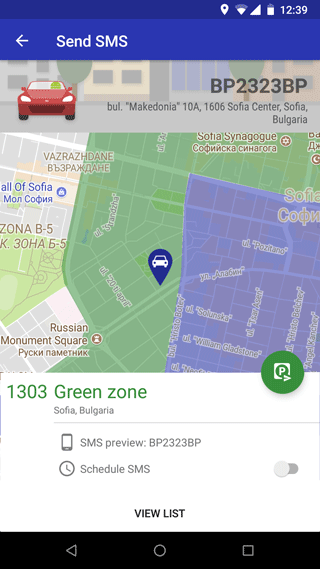 Available parking zones are suggested automatically, based on your location. 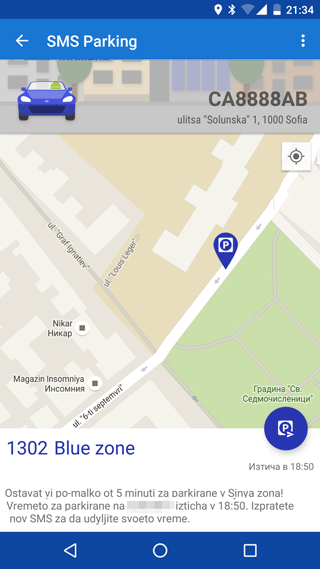 Parking position is detected and displayed on the map in the application along with the nearby parking zone bounds. Your parking location can be displayed on the map within the application so you can navigate to your parking position later. More than 500 parking zones in over 100 cities across Europe and counting! Automatic parking service message recognition and zones with sessions “Start/Stop” are supported in selected cities. Currently supporting cities in Albania, Belarus, Bosnia i Herzegovina, Bulgaria, Croatia, Czech Republic, Hungary, Lithuania, Macedonia, Montenegro, Romania, Russia, Serbia and Slovakia. 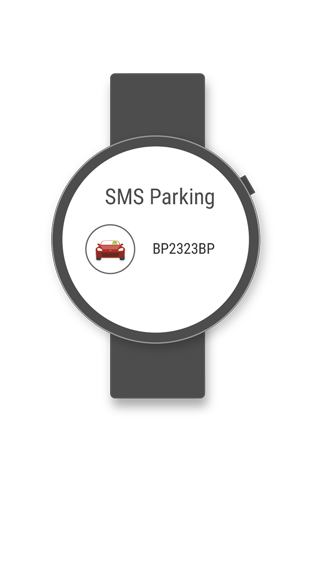 Select car profiles, send parking SMS messages, check confirmations and extend remaining time directly from your smartwatch with Wear OS. Still here? Get the app! Have questions? Email us at support(at)smsparkingapp(dot)com. Become a beta tester of the app and get early access to the latest and greatest new features! Please be aware that the beta version may contain unfinished features that are subject to change. The personal information may include your name, email address, IP address, and anonymous information regarding what sections of the web site are being viewed upon consent. The information we may collect helps us better understand our audience and improve the user experience of our website, resolve technical issues and contact you upon request. Your name and email address may be collected if you provide it to us directly via email or contact form on this site. Your IP address may be stored in our web server’s logs in accordance with GDPR Art. 6(1)(f). The logs are deleted automatically after the next month. Upon consent, our web site may use Google Analytics to track page views and other interactions. Your IP address will be anonymized for Google Analytics. Google Analytics data may be retained maximum for 14 months. Upon given consent, we may analyze page views and other interactions reported in Google Analytics to improve the user experience of our website. Should there be a technical problem with our site (e.g. a missing page) we may review the server’s logs to identify and fix the issue. If you contacted us by email or contact form, we may use the provided information to respond to your inquiry. We do not explicitly share, sell, license or rent your information to third parties, neither we use it for personal profiling and automated decisions. How it will be stored? All data is transmitted in encrypted form using TLS 1.2. We do not store any provided personally identifiable information locally. However, personal information necessary to deliver our services may be obtained by 3rd party service providers working on our behalf, including hosting, internet service and cloud service providers. We have contracted these service providers to treat this information secure and not to use it for any other purposes. Web server log files may be stored by our hosting service provider. Aggregated usage information may be stored upon consent by Google LLC, acting as Data Processor for Google Analytics data. Cookies are small pieces of data, sent from a web server to a web browser, usually stored as a text file that may contain information related to user settings and/or web site usage metrics. This web site may use two types of cookies: (1) Own cookies (2) Cookies, generated by 3rd party services. Own cookies — These cookies are used to store the following user preferences: Content language; Cookie usage banner confirmation. Cookies, generated by 3rd party services — This web site may use 3rd party services that may create their own cookies. We do not have access to these 3rd party cookies. These cookies are subject to the Terms and conditions and/or Privacy policies of the corresponding 3rd party services. Google Analytics — analytical instrument, provided by Google, that helps web site and application owners to find out how their services are being used by their customers. It may use a set of cookies to report metrics about web site usage, without personally identifying individual users. Google Analytics may use advertising cookies to display relevant ads in other Google products. In case you do not want to receive cookies from this web site or from the aforementioned 3rd party services, you can disable cookies handling in the settings of your web browser. 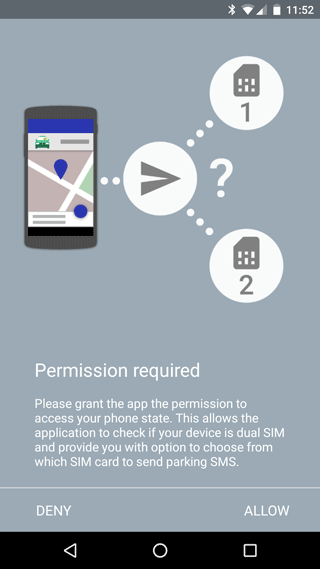 Should you require to receive more information, revoke consent or update or delete any data related to you, please contact us at support@smspakring.app. An verschiedenen Stellen unserer Informationsangebotes verweist unsere Internetseite auf fremde Websites. Die Links dienen ausschließlich der Information - werben jedoch nicht für die Inhalte dieser Seiten. Wir erklären ausdrücklich, dass zum Zeitpunkt der Linksetzung die verlinkten Seiten frei von illegalen Inhalten waren. Wir haben keinerlei Einfluss auf die aktuelle und zukünftige Gestaltung und auf die Inhalte der verknüpften Seiten und macht sich diese nicht zu Eigen. Deshalb distanzieren uns wir hiermit ausdrücklich von allen Inhalten aller verknüpften Seiten, die nach der Linksetzung verändert wurden. Diese Feststellung gilt für alle innerhalb des eigenen Internetangebotes gesetzten Links und Verweise. Für illegale, fehlerhafte oder unvollständige Inhalte und insbesondere für Schäden, die aus der Nutzung oder Nichtnutzung solcher Informationen entstehen, haftet allein der Anbieter der Website, auf welche verwiesen wurde. 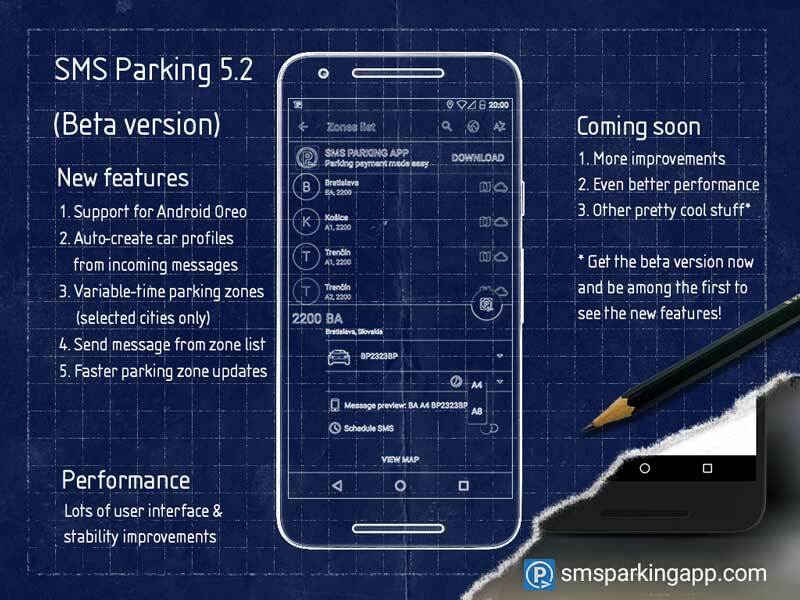 SMS parking is an application for automated parking lot payment via SMS for pre-defined user car profiles. Sending a SMS message charges Your mobile plan with the price of 1 hour parking (or other period, depending on parking service terms) in the respective paid zone (value-added service) plus the price of the SMS message delivery according to your current mobile service payment plan. Disclaimer: The application is provided as is without liabilities or warranties of any kind, either express or implied, including, without limitation, any warranties or conditions of title, non-infringement, merchantability, or fitness for a particular purpose. The author of the software is not liable for any potential losses or damages resulting from usage of this software. The use of this software is solely at your own risk. © 2010–2019 All rights reserved. Unauthorized usage of application's code and resources prohibited. Violations are subject of prosecution with regards to the applicable copyright laws and international agreements. The materials on this web site, including all images and words, are subject to copyright. © 2016–2019 All rights reserved. Unless otherwise specified, You may view and download the materials only for your personal, non-commercial use, provided that You retain all copyright and other proprietary notices, including third-party copyright and other proprietary notices. We have made every effort to ensure correct information on this website at the time of publication. We assume no guarantee for its accuracy and no liability to third parties around the world for all personal injuries, consequential damages, indirect damages, financial losses or other damages caused by the use or reliance upon the information contained in this website. At different points on our website, links are made to external websites. The links are exclusively for information - do not however advertise the contents of these sites. We expressly declare that the linked pages were free of illegal content at the time the links were created. We have no influence whatsoever on the current and future design and on the contents of the linked sites and do not regard these as our own. Therefore, We hereby expressly distance ourself from all contents of all linked sites which have been changed since the linking. This statement applies to all links and references made within our own Internet offering. Only the provider of the website to which reference was made shall be liable for illegal, inaccurate or incomplete contents and especially for damages arising from the use or disuse of such information.